ROAV7 UAVs equipped with thermal cameras can cover large areas or surfaces close enough to get percise details invisble from the ground. Thermal inspection enables our engineers to measure temperatures from a distance, analyse heat constraints, detect gas or liquid leaks, and heat discrepancies. ROAV7 inspects industrial facilities, flares, pipelines, solar farms and tanks. Without shuting down, our UAVs inspect your assets to detect leaks, heating constraints, early signs of weaknesses. Thermal inspection detects invisble flaws in advance, before the actual problems, breakdowns, or accidents. Flying right next to the assets with thermal sensors reveals immediately gas and liquid leaks while assessing the integrity of the reliable assets. 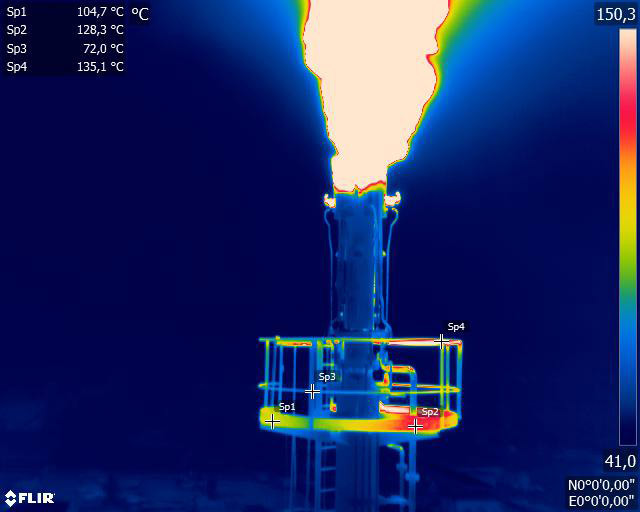 Thermal sensors mounted on drones produce excellent imageries showing the temperatures of the assets at close distance. A two employee ROAV7 team and a backpack containing UAV and remote control is all we need for an inspection mission. ROAV7 missions are quick, safe, and do not need heavy logistics. ROAV7 regularly inspects flares in Congo with thermal cameras. The visual inspection of a flare tip with a UAV having revealed debris, ROAV7 produced a 3D model of the flare tip structures, significantly deformed and torn. 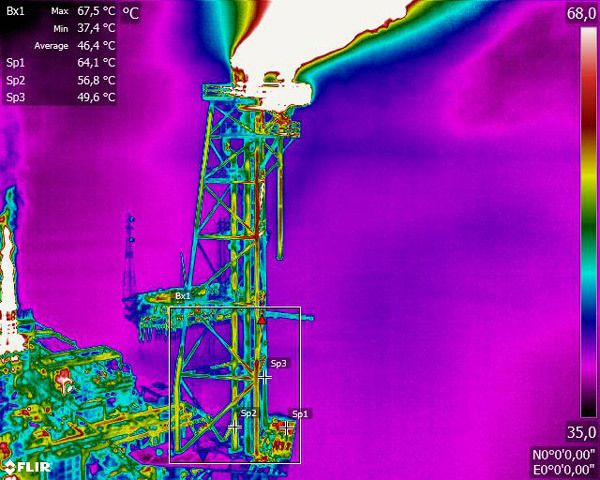 A UAV thermal inspection was performed to identify the heating constraints on the structures and determine the hot spots of the flare. Our client was able to plan its next shutdown intervention and maximize the technicians’ intervention.